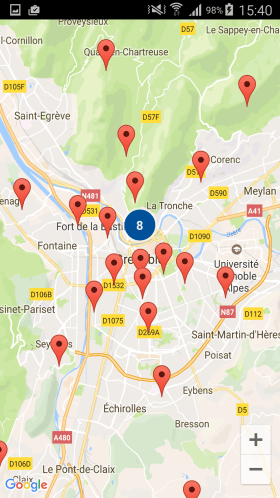 The idea of writing an article on the Clustering of Google Map came to me following a problem that I met when developing the application Moovenow. 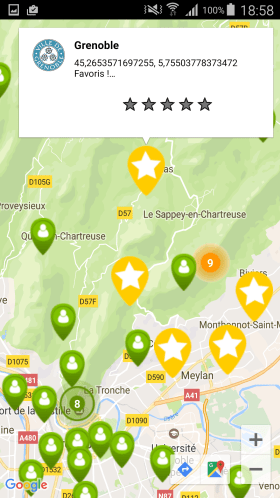 Moovenow, among others, displays a Google Map listing all sports facilities in France, all sports associations in France, as well as sporting events organized on the platform. This potentially represents more than 300,000 markers to display on a smartphone screen! The problem is twofold: not only the loading time must not affect the user, but above all the information must be understandable by the user! Displaying 300,000 markers is not insignificant, especially since each marker does not represent the same type of data. To address this issue, I decided to use the Google Map API. 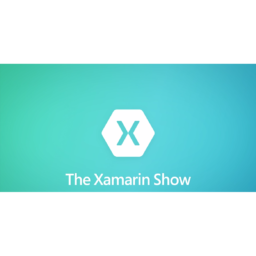 It is accessible on Xamarin thanks to a Nuget package. To begin, add the following nuget packages to your Android project : Xamarin.Android.Support.Design and Xamarin.Android.Maps.Utils. You may need to activate Multi Dex if your solution includes more than 64,000 methods. This is manifested by a “Java exit with code 2” error when compiling. 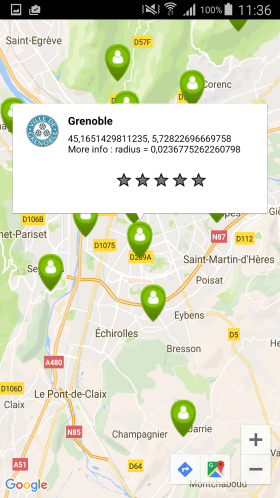 How to display a Google Map? How to add markers that group together when they are too many in the same place? But what interests us is to add many markers on a map. And when there is too many markers in the same place, we want to group them to keep a clean and legible map. This is called “Clustering”. 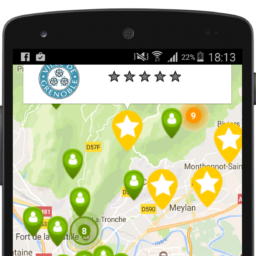 To do that, we will use the ClusterManager class provided by the Google Map API. 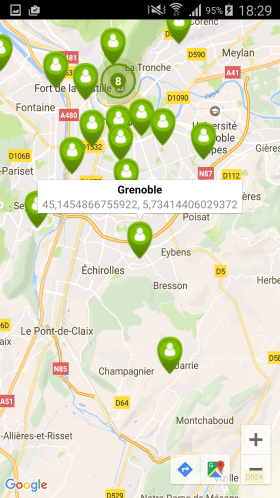 And instead of adding MarkerOptions objects to our MapView, we will add ClusterItem to our ClusterManager. The latter will manage the marker or marker display on its own. As I said above, the ClusterManager does all the work on its own !! How to customize the graphical rendering of markers and grouped markers? We agree ! It is unthinkable to keep the default display of Google markers. You have to customize them to improve the branding of your application. No worries, this is done very well and we will see how. 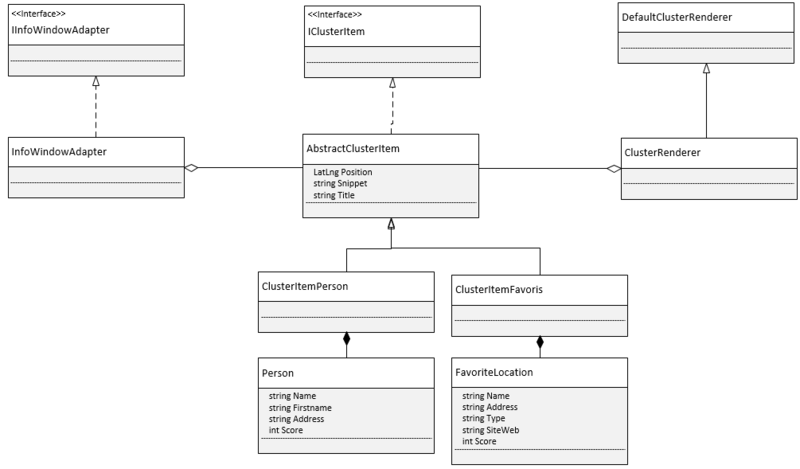 In order to make our ClusterManager use custom rendering, we need to create a ClusterRenderer. It is thanks to this renderer that we will be able to specify to the ClusterManager which image to display in which case. For example, when we need to display a simple marker, we want to display the picture named “marker”. And when it is necessary to display a clustered marker, we will display the picture “marker_cluster_grouped” + the text indicating the number of marker grouped. Everything is available in my Github if you want to recover the pictures. You can now admire the fruit of your work! It’s still more fun than the default images is not it? InfoWindows are small windows that appear when a user clicks on a marker. By default, these windows display the title and description associated with the Marker. Do you remember ? They are in parameter of the ClusterItem class. On the other hand, when a user clicks on a marker grouping, you do not need to display InfoWindow. Instead, you should center the map around this point. How to display a default InfoWindow? How to display a custom InfoWindow? Want to display a particular image in your InfoWindow? Or a RatingBar for example? No problem ! It is possible to customize the InfoWindow with our own view based on an AXML file. We will see step by step how to put this in place with our ClusterManager. Usually (except Clustering), to use a custom InfoWindow you need to create an InfoWindowAdapter and then configure your MapView to use this adapter. In Clustering, if you do this, the InfoWindow will appear even if the user clicks on a marker grouping. It’s not good ! That’s why the trick is to let our ClusterManager handle the InfoWindows. With the code below, we will tell our ClusterManager that it must use our custom InfoWindowAdapter previously created, for simple markers only. Then we will tell our MapView that it must use the ClusterManager as InfoWindowAdapter. These are the two lines of code 20 and 21. How to display specific information in the InfoWindow? In the previous paragraph, we saw how to add a custom InfoWindow. But we have not seen how to change the information displayed according to each ClusterItem! If my markers represented people, I would like the InfoWindow to display their name, first name, and their score on 5 stars for example. This is what we will see in this paragraph. Now that we have our dictionary linking the Markers to their associated ClusterItems, it is enough that our InfoWindowAdapter keeps a reference to this dictionary and it’s done! How to limit the cluster by marker type? For the example, I will add a categories of marker “favorites”. These markers will be yellow (and not green like the others). And the groupings of yellow and green markers will be independent. Similarly, the InfoWindows will be independent as well as the actions to be taken following a click on the InfoWindow. Let’s first modify our Clusteritem class. If m_bIsFav is true, then the marker will be yellow. Otherwise, it will be green. Everything is fine ? Breathe a good blow, that’s where everything is played! In our Activity we will create multiple instances of ClusterManager in order to have independent clusters. Similarly, there will be multiple instances of ClusterRenderer. On the other hand, we keep a single instance of InfoWindowAdapter, which will be reused by the different ClusterManager and ClusterRenderer. Also, since there are multiple instances of ClusterManager, you can no longer use the “m_map.SetOnCameraIdleListener (m_ClusterManager);” line of code. 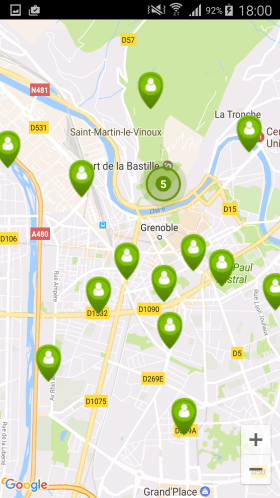 We need to manually trigger OnCameraIdle events from ClusterManagers. This is why the Activity must implement the IOnCameraIdleListener interface. Take your phones for the long-awaited result! How to organize my code to manage different types of markers? In the previous example, I used a ClusterItem for all my marker types (favorites and non-favorites). For an example, that’s enough. But for a sustainable and evolutionary code, I would advise rather to lean towards an abstract class, and a class implementing this abstract class for each type of marker. As a result, the InfoWindowAdapter and ClusterRenderer custom classes will only be created once, regardless of the number of marker types.